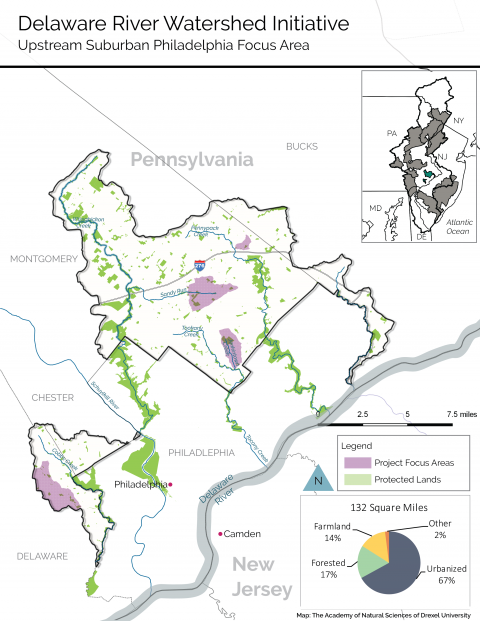 Five hydrologically separated stream systems run through the Upstream Suburban Philadelphia Cluster of Watersheds. The Pennypack, Tookany and Wissahickon Creeks flow into the city from the northwest, while Cobbs (Darby Creek’s largest tributary) and Poquessing Creeks define the city limits to the southwest and northeast, respectively. These watersheds encompass 193 square miles, including 61 square miles within the City of Philadelphia, outside the cluster boundary. The cluster includes the upstream suburban portions of these watersheds in Bucks, Delaware and Montgomery Counties, where about 400,000 people reside. The waterways lie within the nation’s sixth-most-populous metropolitan area and are heavily urbanized. Most of the landscape is developed and has been converted to impervious surfaces—roads, parking lots, buildings—that generally cover from 25 to 50 percent of the landscape but can reach much higher percentages in town centers. The cluster’s streams flow through all or parts of 36 different municipalities including historic boroughs, as well as first- and second-class townships, governed by nearly 300 elected officials. Almost all of the reaches of the cluster’s waterways are on Pennsylvania’s list of impaired streams due primarily to urban stormwater runoff and secondarily to excessive sediment and nutrient pollution. 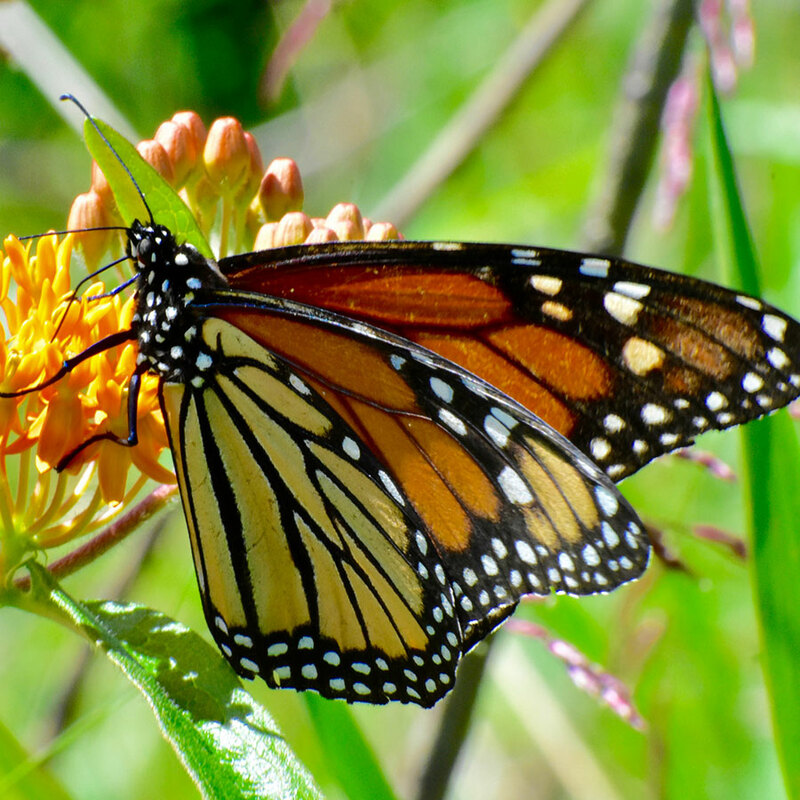 The region includes an extensive network of streamside parks and greenways that provide significant ecosystem services as well as recreational opportunities. Over 70 miles of walking paths and multiuse trails extend within and along the stream corridors of all five watersheds. Some notable examples are the greenway along the Pennypack and the Green Ribbon Trail along the Wissahickon. Despite the important parks in the cluster, this area has extremely limited land available for protection, so the Initiative will need to achieve water quality improvements through restoration of degraded areas. Total Area 132 Sq. Mi. Urbanization fundamentally alters the characteristics of watersheds—their hydrologic cycle, riparian corridors, stream geomorphology, and assimilative capacity—thereby affecting water quality, water quantity, habitat, and ecosystems. “Flashy” stormwater erodes stream channels and leaves them choked with sediment and pollution. Efforts to improve water quality must be coordinated across multiple jurisdictions. Urbanization is the greatest stressor to the Upstream Suburban Philadelphia Cluster. Poorly managed and unmanaged stormwater flows are the most severe stressors and are of particular concern given that this cluster comprises the most densely developed landscape in the Delaware River basin. Additionally, effluent from wastewater treatment plants (WWTPs) contributes large portions of base flow in many of the cluster’s stream tributaries and causes nutrient pollution. The furious flush of stormwater across extensive impervious surfaces overwhelms streams and severely restricts groundwater recharge. As the water flows across streets and parking lots, it collects heavy metals, petrochemicals, garbage and other harmful substances and delivers them directly into waterways. In headwater areas further upstream, public groundwater withdrawals for drinking water deplete streams that are left to be replenished by wastewater treatment plant discharges, resulting in stream flows that are at times predominately treated effluent. The Wissahickon Creek is an example of an effluent dominated stream, which flows into the Schuylkill River just upstream of one of Philadelphia’s drinking water intakes. The confluences of both Pennypack and Poquessing Creeks with the Delaware River are also near the Baxter Water Treatment Plant, the city’s largest drinking water intake and treatment facility. Philadelphia is home to one of the nation’s most innovative approaches to reduce stormwater pollution and restore water quality with a $2.5 billion plan to install over 10,000 acres of “green” practices, transforming Philadelphia into an “emerald city.” But stormwater issues don’t stop at the city line. Restoration projects in the suburbs upstream of the city could make a major difference in this unprecedented effort to restore waterways degraded by centuries of industrialization and urban development, benefitting both the upstream communities and downstream users. The region has many streamside parks, greenways, and private lands where stream banks and riparian buffers can be restored. Because infiltration management helps control the rate and volume of runoff, the groups will work with residents to build rain gardens, bioswales, and other capture-and-retention systems that intercept stormwater and pollutants, reduce erosion, and prevent further stream degradation. They will also conduct community programs on water quality, citizen monitoring, and green infrastructure maintenance. Another focus is promoting consistency among municipalities in policies that affect water resources, including ordinances on riparian buffers and steep slopes. And the groups will develop green infrastructure guidance for managers of corporate parks, shopping centers, schools, and other large properties. Accomplishments to date: Partners have restored riparian buffers, stabilized or restored stream banks, and monitored 108 sites for improvements in water quality. 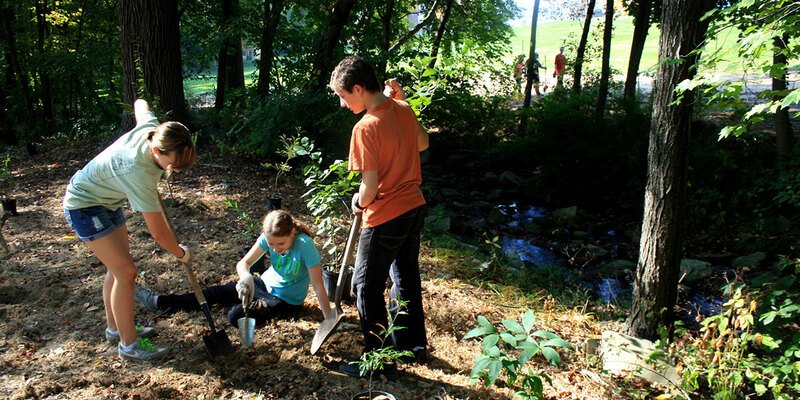 More than 300 volunteers have been trained as stream monitors, and thousands of citizens have donated nearly 9,000 hours at clean-ups, plantings, and educational events. Projected outcomes: Stream restoration efforts (nine projects restoring three stream miles) and stormwater control measures (40 projects treating 739 acres) will reduce nutrient, sediment, and bacterial pollution; reduce the volume and velocity of runoff; and reduce flooding after heavy rains. Success will build urban communities’ support for future initiatives. The monitoring for this plan has two goals: to evaluate the effectiveness of stormwater controls and to determine where to install new controls. Each of the five focus areas will have monitoring stations of varying levels of intensity. Cluster organizations will identify additional monitoring points to correspond with new or upgraded stormwater controls. Measurement will include hydrologic and hydraulic modeling that university professionals will conduct on a site and sub-watershed basis. Along with monitoring, the modeling will seek to accurately predict the effects of stormwater controls and provide an analytical framework for planning and sequencing future controls. University researchers, members of watershed groups and trained citizens will collect the monitoring data. The project team will develop a suite of tools that will engage citizens in monitoring. For example, a web-based, interactive map will invite direct public input, including pictures, comments and project profiles, and enable the sharing of project information through social media. A smartphone app will allow citizens to submit monitoring data in a standardized form or simply view project information; the app will link with specific monitoring sites by placing a Quick Response (QR) Code on signage in the field. The cluster team will offer a robust training program to recruit volunteers and strengthen their monitoring programs. The partners seek $3.8 million in funds from public and private sources, including from towns, the Commonwealth of Pennsylvania, federal agencies, and the contributions of homeowners and sweat equity of volunteers. Darby Creek Valley Association, Eastern Delaware County Stormwater Collaborative, Friends of the Poquessing Watershed, Lower Merion Conservancy, Pennsylvania Environmental Council, Pennsylvania Resource Council, Pennypack Ecological Restoration Trust, Philadelphia Resources Council, Temple University, Tookany/Tacony Frankford Watershed Partnership, Villanova Urban Stormwater Partnership, Wissahickon Valley Watershed Association.